Latin America is suffering from an acute case of the incumbent’s advantage. The incumbent’s advantage refers to the factors that give incumbent presidents a higher chance of winning elections relative to challengers. The incumbent’s advantage exists in all presidential democracies, but in Latin America, as I argue in a recent paper1, it seems to be disproportionately large. This bodes badly for democracy. 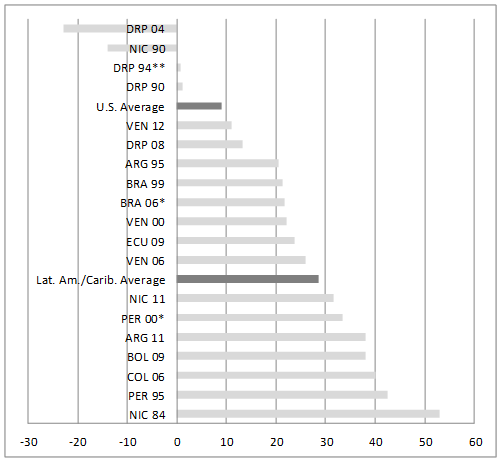 Figure 1 shows the electoral performance of incumbent presidents in Latin America since the 1980s, compared to the United States since the 1930s. Incumbents in Latin America are being re-elected frequently and by large margins. Incumbents have won all elections in which they have been allowed to run, except just two: Daniel Ortega in Nicaragua in 1990 and Hipólito Mejía in the Dominican Republic in 2004.2 With Hugo Chávez’s third reelection in October 2012, Latin America now has a record of 16 incumbent victories out of 18 contests. This record makes “incumbency” the variable that best predicts electoral outcomes in Latin America. And in February 2013, with the seemingly inevitable re-election of Rafael Correa in Ecuador, the record will get stronger. The difference with the United States is stark. First, in the United States the incumbent’s advantage seems to be declining. Since 1972, three out of eight incumbents have been defeated. Second, when incumbents win, they do so by much narrower margins: an average point difference of 9.0 relative (since 1936) to 28.7 points for Latin America (since 1984). This average for the United States includes the extraordinarily large advantage enjoyed by FDR during the recovery (1936) and during the war (1940) and by Ronald Reagan’s landslide victory during the recovery of 1984. Notes: This is the point difference in the popular vote between the incumbent and the leading challenger. * Second Round. ** Allegations of fraud. Source: Author’s calculations based on official government sources. Three points deserve clarification. The incumbent’s advantage that I am discussing refers to presidents running, not to the president’s party. In Latin American, ruling parties get defeated frequently enough (especially in the 1990s). They get far less defeated when it is the incumbent president who is running for reelection. Second, the incumbent’s advantage affects only those countries that permit consecutive reelection. In cases where consecutive reelection is banned, this aspect of the incumbent’s advantage is a moot point.3 However, the trend in the region since the 1990s has been for countries to relax term limits in favor of consecutive re-election, and in the case of Venezuela and Nicaragua, multiple re-elections. Third, it is true that in the United States the popular vote is constitutionally inconsequential. What matters is the electoral college, which except in 3 elections, exaggerates the point difference of the winner in the popular vote. But the popular vote is still politically important: it showcases the relative strength of each party. This point is vital. The fact that the point difference tends to be smaller in the United States is one more reason that elections are not as destabilizing: defeated forces don’t feel like hopeless losers and the winners don’t feel that they have a green light to plow ahead. In the words of North, Sumerhill and Weingast, small margins of victory keep the stakes of power-holding low4, and conversely, the stakes of losing not too high. In Latin America, in contrast, re-elected incumbents end up feeling excessively empowered, and the opposition, severely crushed and ineffectual, leading to profound crises, and further fragmentation within their ranks. The larger point difference in Latin America thus compromises the system of checks and balance that is central to democratic governance. But thinking beyond these (hard to prove) attitudinal factors, there are institutional variables that also play a role: first, the strength of state institutions relative to other political forces in the country; and second, party system fragmentation. This explains why incumbents in general tend to do well in elections. A study of elections in 83 democracies between the 1950s and 1999 showed that between one term and the next incumbents lose votes only “moderately”.7 For incumbents to experience extreme losses (e.g., 20 percentage points), the country needs to be subjected to “extreme circumstances” (e.g., weak economies, new democracies). When there is economic growth, the electoral losses are minimal (ibid). In Latin America, there actually seems to be very little connection between economic performance and incumbent’s defeat. Figure 2 shows the average GDP per capita growth rate for the two years prior to the election. The relationship is weak, to say the least. Incumbents get reelected even in conditions of recession and low growth (under 2 percent). Extreme circumstances are needed to defeat incumbents in Latin America. In Nicaragua 1990, the country was suffering from a brutal recession and four-digit inflation, as well as a civil war and the rise of a highly respected challenger, Violeta Chamorro). In the Dominican Republic 2004, the economic situation was not as dismal, but it was deteriorating: inflation, for instance, was spiking up from 5 percent two years prior to the election to 51 percent the year of the election. Furthermore, the incumbent was competing against another highly respected challenger, former president Leonel Fernández. In short, it seems that in Latin America, two extreme circumstances are needed to defeat an incumbent: dismal economic performance or super-prestigious challenger. Note: GDP Per Capita Growth = Average for two years prior to election. Source: Author’s calculations using data from World Development Indicators. The other reason that presidents win so big in Latin America, relative to the United States, has to do with opposition disunity. Except for a few cases, opposition parties in Latin America seldom unite coming up to elections. A divided opposition works toward the advantage of the president: it weakens the chance of challengers winning, and also leads to greater point difference for the winner. In the one only recent case where the opposition has united, Venezuela 2012, the president won by one of the lowest margins of victory in Latin America. This is an important point to make. Chávez’s re-election in 2012 was significant relative to the magnitude of the country’s economic ailments (meager recovery, infrastructure collapse), and social performance (booming crime). But it is small relative to Chávez’s previous margins of victory and relative to Latin America’s incumbent victories. This relative small margin of victory has to do with the fact that the opposition, unlike the opposition to most incumbents in Latin America, united behind l a large coalition, the so-called Mesa de la Unidad. To conclude, relaxing term limits in Latin America seems to have increased the incumbents’ advantage. Disunity of the opposition seems to have increased the magnitude of incumbents’ electoral victories. This magnitude provokes undue crises in losing parties, and in the end erodes checks and balance on the Executive branch. The incumbent’s advantage in Latin America does not seem to work toward democracy’s advantage. 1. Corrales, Javier. 2012. “Tinkering with Term Limits in Latin America.” Amherst College (mimeo). 2. Between 1989 and 2011, there were 17 elections permitting incumbents to run in Latin America (including all Spanish-speaking countries plus Brazil). Incumbents ran in all these elections except in two: Duhalde in Argentina in 2003 and Kirchner in Argentina 2007. 3. Mexico, El Salvador, Guatemala, Honduras, Costa Rica, Peru, Chile, Uruguay. 4. North, Douglass, William Summerhill and Barry R. Weingast. 2000. “Order, Disorder, and Economic Change: Latin America versus North America. In Bruce Bueno de Mesquita and Hilton L. Root, eds. Governing for Prosperity, Yale University Press, pp. 17-59. 5. See Corrales, Javier. 2008. “Latin America’s Neocaudillismo : Expresidents and Newcomers Running for Office in Latin America,” Latin American Politics and Society 50:3 (Fall):1-35. 6. Corrales, Javier. 2008. "Latin America's Neocaudillismo: Expresidents and Newcomers Running for President...and Winning." Latin American Politics and Society 50(3): 1-35. 7. Barreiro, Belén. 2008. "Explaining the Electoral Performance of Incumbents in Democracies." Controlling Governments: Voters, Institutions, and Accountability. J. M. Maravall and I. Sánchez-Cuenca. New York, Cambridge University Press: 17-44.